Sometimes an online journal, other times an informational website, a blog is the internet’s way of indulging opinionated writers and coaching curious readers. It’s a place within the online universe where individuals (or groups of them) may voice their thoughts and share them with millions. The most popular blogging niches tackle personal finance and development, health and fitness, beauty and fashion, and everyone’s favorite – food blog. Blogs can be deeply personal and introspective, resembling an online diary. When written by professional journalists, they possess enough power to influence business and politics. A common question about a blog is how it relates to a website – are these two essentially the same, or are there any differences between them? While websites are mainly presentational, blogs are always intended to engage. A website is therefore static, as opposed to a blog which must be dynamic. The information offered by websites is presented on static pages, in the form of an evergreen content that doesn’t require any updates. Blog posts, on the other hand, are like diary entries; they include a publishing date and meta tags. New entries and regular updates are key to running any kind of blog. Unlike with a personal diary written in a notebook, blog entries are displayed in reverse chronological order – the newest posts being on top. The latest ones push previously published ones down the list until they completely disappear from the landing page. Older posts are usually archived on the following pages, but they can also be organized by the month or year when they were first published. First comes a header with the menu or navigation bar to declutter the page and make a great first impression. It’s followed up by main content area on which blog posts appear either by order of publishing or by relevance. Down below are contact pages, privacy policies, and relevant links, neatly arranged in a footer. 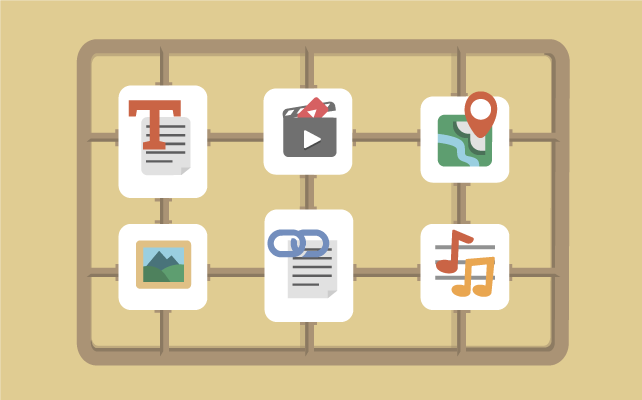 A sidebar highlights favorite entries and displays social profiles and call-to-actions. 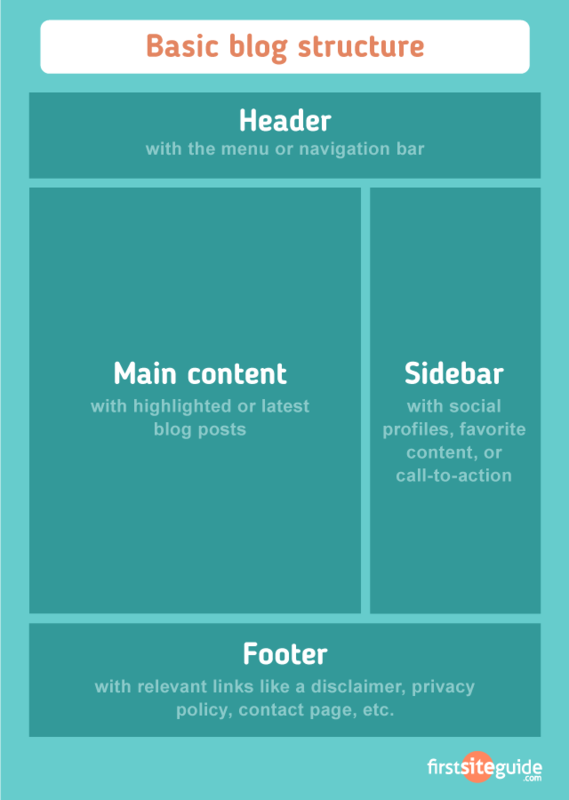 <a href=”https://firstsiteguide.com/characteristics-of-blog/”><img src=”https://firstsiteguide.com/wp-content/uploads/2015/01/basic-blog-structure.png” alt=”Basic blog structure”></a><br />Basic Blog Structure free template was created by <a href=”https://firstsiteguide.com/”>FirstSiteGuide.com</a> team. Different blogs publish different types of posts, though a majority of them relies on the power of the written word. Depending on the author’s intention, an article is typically an opinion piece, an instructional guide, or a news post. Monotonous chunks of text are separated with images or videos. A blog post can also be a picture with little or no text. It’s a common trend in fashion and travel blogs, though it’s also not rare for business-related niches to publish infographics instead of instructional articles. But regardless of the medium, a blog is always defined by the quality of its published content. Naming a blog post is an art by itself. There’s a whole philosophy behind writing article headlines – a compelling one can truly silence the noise, instantly generating clicks, driving traffic, and enticing a reader to read on. Nowhere in the online universe are titles given the same kind of attention as here. Though every engaging content must be relevant, this rule especially applies to blogs posts. They might differ in types, mediums, formats, and styles; in order to arouse interest or evoke debate, they have to be original and unique; but to be read at all, blog posts must always deliver upon their promise. As a promotional strategy, link building is not limited to blog posts, but it definitely is a characteristic that all decent blogs share. Blogs and links go hand in hand even when marketing isn’t the goal. Internal linking, for instance, ensures intuitive navigation between mutually relevant posts, thus providing an exceptional reading experience. It’s about the flow and facilitation of knowledge transfer. The word “blog” derives from an earlier version “weblog”, which initially referred to personal online journals. Before blogs became political in the early 2000s, they were merely means to make private thoughts and opinions public. The personal touch, however, remains their vital characteristic to date. Even with today’s universal topics, the recommended interpretative approach is the one that implies uniqueness. If the subject matter requires utmost objectivity, the personal touch is accomplished through individualistic writing style. Every blog author has an “About Me” page and a distinct signature mark. The comment section is another mutual characteristic of respectable blogs. It’s typically located at the end of every post, as a place for readers to engage in a conversation and leave their honest feedback. The ability to provoke a response and encourage interaction is held in the highest regard by all readers. With or without an open debate, communication is still the end purpose of each and every blog post. If the blog is promotional, its goal is to attract the audience and open a dialogue that will hopefully convince them to buy what the owner is selling. If not about sales, then it’s about spreading the word. Whether it imparts knowledge, provides solutions, or simply entertains, blogging is a brilliant way of reaching out and communicating with the world. Without any question at all, such transformative power of free expression and exchange is the single most important characteristic of any terrific blog. Every blog post requires time and effort. The time spent on creating quality posts translates directly into more clicks and higher site traffic, making the investment worth it. There are many things that can influence the quality of your blog posts, and it all mostly depends on your niche, style, and the audience. However, no matter how diverse the blog posts are, there are still a few things that everyone should pay close attention to if they want to leave an overall good impression on their readers. We’ve already touched upon the topic of monotonous chunks of text and how undesirable they are in blog posts. The reason behind this being how quickly your readers make a judgment about your post. You have just about 50 milliseconds to make a good first impression. Blocks of text are often overwhelming, and if the readers cannot scan through the text with ease, they’ll move on from your site. So, make sure to use short paragraphs, break up the text with some interesting visuals such as images, GIFs, videos, infographics, etc. One of the most common questions about blog posts is how long they should be. The simplest answer is long enough. Most would believe that because of the shorter attention span of readers, the posts themselves should be shorter. The fact of the matter is that as long as your post is informative and as long as it answers your audience’s questions, it doesn’t matter how long it is. If you have a 500-word limit but have much more to say on the topic, go right ahead. On the other hand, don’t spread out 500 words worth of content to 3000 words. The focus should be on the quality of the content. As long as the blog post offers value to the reader, its length is unimportant. Regardless of the niche you choose for your blog, it’s more than likely that someone has covered the topic before. Everything’s already been said and done, but this doesn’t mean you should just copy-paste the content. Primarily, to stand out from the crowd, you need to offer a new approach to the covered topics. This can be done with your tone of voice, style of writing, or point of view. Going back to that “personal touch”, if you’ve chosen a niche that you’re passionate about, offering your own unique approach to it shouldn’t be difficult. Every high-quality blog post requires time and effort invested in the research. The more you devote yourself to the research, the easier it becomes to write the post. Primarily, this will give you insight into other’s opinions on the topic, you’ll dive deeper into it, making it easier to form your own unique approach to it. Secondly, the easiest way to lose readers is by being unreliable. Every claim should be backed up by evidence, so links and citations from credible sources are essential. Ready to start a blog on your own? Starting your own blog is done in a few steps. First, you need a name for your blog and to choose the blogging platform. We strongly recommend WordPress.org, the self-hosted platform. Once you decide on your name you will need to open a web hosting account. For new bloggers, we recommend Bluehost, a company that powers over 2 million websites worldwide. You will get a Free domain name when you sign up with them and they offer a 30-day money-back guarantee. The blog’s definition may be elusive, but that’s fine. As any blogger can testify, the allure of this practice stems from its diversity. The previous characteristics are thus more what you would call guidelines than they are uniform rules, except for one common denominator. Communication remains the essence of blogging, while everything else serves to help us engage, entice and delight our readers. Thank you so much! Will be keeping all of these in mind. Awesome article! Awesome website, I like it. Thanks a lot for helping us like this. This is so insightful! Do you perhaps have an article which explains why bloggers should focus on writing in-depth articles instead of short ones? I would really like to learn more about this topic. Blogging is definitely a wonderful way to reach out and communicate with the world! I met so many wonderful people, just by following their blogs and interacting with them, so now I’m thinking of starting a blog on my own! Thanks Susan! If you need any help with starting your blog, feel free to contact us! I absolutely agree that headlines should be attention grabbers! Good point on headlines, Jo. Thanks! Awesome website i like it, thanks alot for helping us like this.